Patch 7.1 has landed on the live servers and we are ready to once more delve into the depths of Karazhan, prove our worth in the Trials of Valor and continue to help the Nightfallen in their bid to retake Suramar. Thalyssra is running a rebellion right? Well, we rebel! In addition, the patch brings changes to our talents. Let’s take a look at how the changes alter the way we evaluate each talent. First Avenger: Avenger’s Shield now adds +50% damage to the first target, and +10% Grand Crusader proc chance. Bastion of Light now has a 2-minute cooldown (was 3 minutes). Crusader’s Judgment now has 2 charges, and Grand Crusader now also grants a charge of Judgment. Patch 7.1 brings changes to each of the Level 30 talents. While not stated in the patch notes, First Avenger no longer causes Avenger’s Shield to only hit one target which removes the major downside of the talent. Instead the 50% damage increase is applied to the first target and it still bounces to the secondary targets. But the developers weren’t satisfied that would bring First Avenger up to the level of the other two options so they also increased the proc chance of Grand Crusader. First Avenger will be a good choice for 5 mans, especially Teeming Mythic Plus dungeons, but still lags behind the other options on that row for Raids. Crusader’s Judgment now gives you two stacks of Judgment, and also allows Grand Crusader to give you a charge of Judgment. Judgment reduces your Shield of the Righteous (ShotR) cooldown. With this change, the developers have rejoined Avenger’s Shield and its associated Grand Crusader procs back to our Active Mitigation. Will Crusader’s Judgment now give more uptime to the ShotR Active Mitigation buff than Bastion of Light (BoL) which had its cool down lowered to two minutes? Paladin theorycrafter Luminara did the math on the official forums. Let’s walk through his example. Mythic Ursoc is considered the tanking “Patchwerk” fight, a real world tanking target dummy. 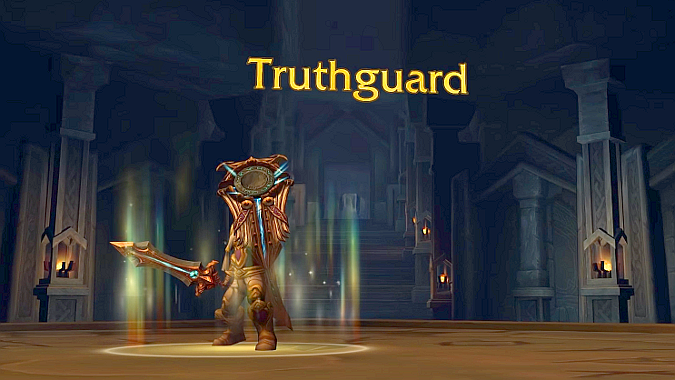 If we take the current #1 parse from Warcraft Logs for Mythic Ursoc, we see that our fellow Tankadin Blueprint of Honestly on Frostmourne (US) cast Avenger’s Shield 30 times during the fight which lasted 3 minutes and 52 seconds. According to his armory, Blueprint has about 30% haste which would take the baseline cooldown of Avenger’s Shield down to 11.5 seconds. To simplify our analysis, we will ignore temporary haste buffs from things like Seraphim and Heroism. With zero Grand Crusader procs, he should have been able to cast Avenger’s Shield 20.1739 times. 3 minutes and 52 seconds is 232 seconds divided by 11.5 second cooldown gives us 20.1739. Since we’re friends, we’ll round that 20. We see 30 casts in the log, and on average, a Grand Crusader proc will remove half your remaining Avenger’s Shield cool down. From that, we can infer he got 20 Grand Crusader procs. In 7.1, those 20 procs would have meant 20 extra casts of Judgment through the additional Judgment stacks. He has a 30% Critical Strike chance, so 6 of those extra Judgments would have crit, along with 14 non crits. The 14 non crits gives 28 seconds of ShotR reduction and the 6 crits give 24 seconds of reduction for a total of 52 seconds of reduction. His ShotR recharge rate is 12.3 (given his haste level). We conclude that in 7.1, he would have gotten 4 (52/12.3) extra ShotR casts over the 3 minute and 52 second fight. With the 7.1 version of Bastion of Light (2 minute cool down), he would have gotten 6 addition ShotR casts if we model them at 0, and 120 seconds into the fight. Even at that point, Bastion of Light comes out ahead. Futhermore, he would have gotten 3 more ShotR casts had the fight lasted 8 more seconds for BoL to come off cooldown. Bastion of Light still gives more uptime than the new Crusader’s Judgment, and for raids and Mythic dungeons, it will remain the go to choice. The other change we received is that the Level 60 talent Retribution Aura no longer ignores tanks. Before 7.1, Retribution Aura would only proc on melee attacks made to non-tanks in the party. In 7.1, it procs on melee attacks made to tanks as well. With this change, it goes from useless to decent. The other two talents on that row are situational. If there is a mechanic in the encounter that we can help a key member of the raid team survive through Blessing of Spellwarding, we’ll take that. If there is so much movement required that we need the two charges of Divine Steed from Cavalier, we’ll take that. I haven’t encountered any fights yet where I needed the second charge on Divine Steed, but perhaps something in Trial of Valor or Nighthold will. If neither of those conditions exists, Retribution Aura would be the choice. I had Cavalier in 7.0 to get in and out of Shal’aran faster, but I will be switching to Retribution Aura in 7.1. Every single one of the 7.1 changes serves to increase Protection Paladin DPS. I have no clue why they are buffing our DPS. I don’t have any trouble soloing and completing World Quests (except those stupid Enigma quests from the Kirin Tor, but that has nothing to do with my DPS). I mean, I’m not going to look the proverbial gift horse in its proverbial mouth but I don’t want another hotfix nerf like we got after launch either.